By Terry Dunn on Aug. 4, 2016 at 8:59 a.m. In this final installment of the series, I'll show you how I added a power system to give the glider model longer flights, a wider performance range, and more control. We turn it into an airplane! 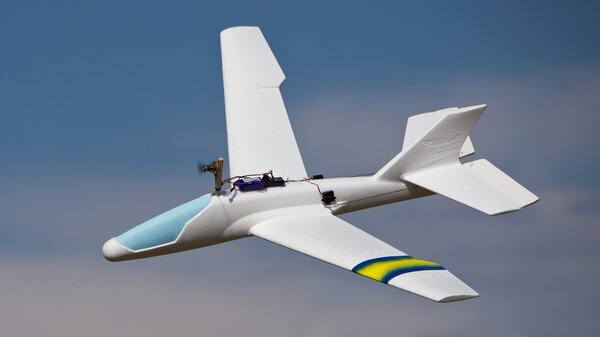 In previous articles, I've shown you how to convert a toy store glider to RC and how to use that glider for learning to fly. 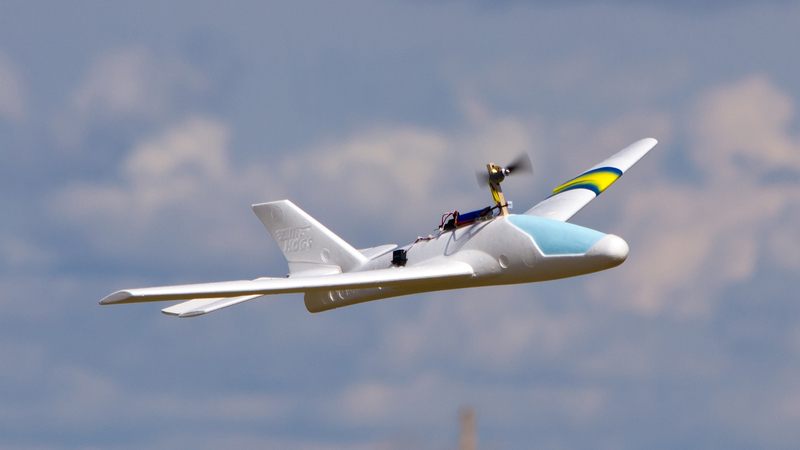 After you've spent a little time with the glider, you should have a much better understanding of what it takes to fly an RC model successfully. In this final installment of the series, I'll show you how I added a power system to give the model longer flights, a wider performance range, and more control. The glider I've been using is the Air Hogs Titan. Just like every other aspect of the conversion to RC, I approached the power system with the aim of keeping everything as simple and straightforward as possible. What results is an affordable, functional and well-behaved model that is not likely to overwhelm RC newcomers. I was really happy with the power system that I installed in my Airplane! model (another chuck glider conversion), so I decided to repeat it here. It consists of an ElectriFly Rimfire 250 brushless motor, a GemFan 5x4 propeller, a 3S-500mAh LiPo battery, and a Flight Power 6-amp Electronic Speed Control (ESC). This particular ESC is no longer made. The Castle Creations Thunderbird 9 is a good substitute. The ESC has a Battery Eliminator Circuit, which provides power to the onboard radio gear from the flight battery. This allowed me to get rid of the 4-cell 1100mAh NiMH battery that previously powered the radio. In fact, the combined weight of the new power system components is within a gram of the weight of the NiMH battery alone. So the Titan is no heavier as a powered model than it was as a pure glider. 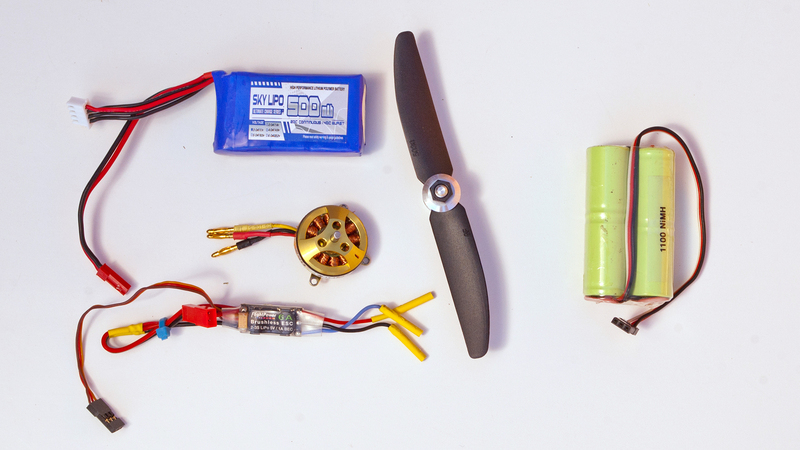 The power system components I used are almost the exact same weight as the radio battery used for the glider version of the Titan (right). Rather than locating the motor in the tail, as I did with my knotted airliner, I decided to mount the Rimfire to a pylon on top of the fuselage. Among the benefits of this configuration are short wires and minimal weight distribution. The high location also helps to keep the motor out of the dirt and grass during landings (and crashes). The only significant tradeoff of the pylon-mounted motor arises when you launch the model. I'll talk about that a bit later. I used a 6" x 3/8" square hardwood dowel as the pylon. The Rimfire has a built in mounting bracket with three arms at right angles. I predrilled the dowel to mate with two of those arms and left the third arm unused. I also had to cut a shallow notch on the forward face of the dowel to make room for a small nub of the motor shaft that protrudes from the rear of the motor. 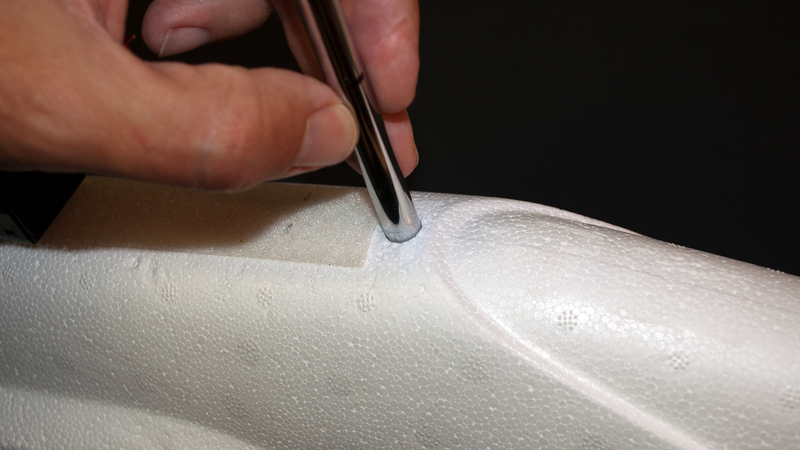 Approximately 2-1/2" of the dowel is imbedded into the top of the foam fuselage. The best way that I've found to drill holes in foam is to use a sharpened metal tube…usually brass or aluminum. I didn't have a 3/8"-diameter tube handy, so I scavenged several sections of tubing from an old telescoping radio antenna and found the perfect size! 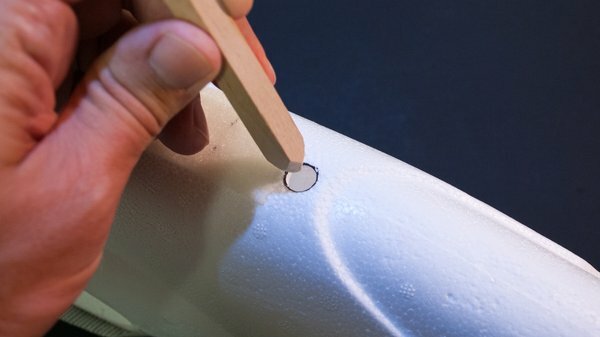 Sharpened metal tubes are great for drilling holes in foam. This tube was scavenged from a telescoping radio antenna. The motor needs a slight upward tilt to counteract the downward tilting force created by having the motor mounted up high. Just a few degrees it all it takes. The area of the fuselage just behind the faux cockpit canopy already has a downward slope to it. So I decided to drill the hole for the pylon perpendicular to this surface. I started the hole slowly, making sure that I was maintaining the desired tilt angle while also being perfectly vertical when viewed from the front. When drilling was complete, I was literally left with the classic problem of a square peg and a round hole. In this case, it's really no problem at all. I sanded the bottom end of the dowel to give it a slight point. I was then able to push the dowel into the hole without ripping the foam. I did my best to make sure that the front side of the pylon was facing perfectly forward as I inserted it. After test fitting, I removed the pylon, added a little Gorilla Glue, and put it back into place. I sharpened the bottom end of the motor pylon so that it could be easily inserted into the hole in the fuselage. Once the glue for the pylon dried, I installed the motor. I then connected the ESC between the receiver and the motor. On Tactic radios, such as the TTX850 that I'm using (and Futaba brand radios) you must reverse the throttle channel on the transmitter for ESCs to work correctly. This is typically done via an on-screen menu or a physical dipswitch. Before mounting the propeller to the motor, I attached the battery and made sure that the motor spun in the correct direction when I applied throttle. The standard direction is clockwise when viewed from behind the motor. If the motor is spinning in the wrong direction, you merely have to swap connections on any two of the three wires between the motor and ESC. 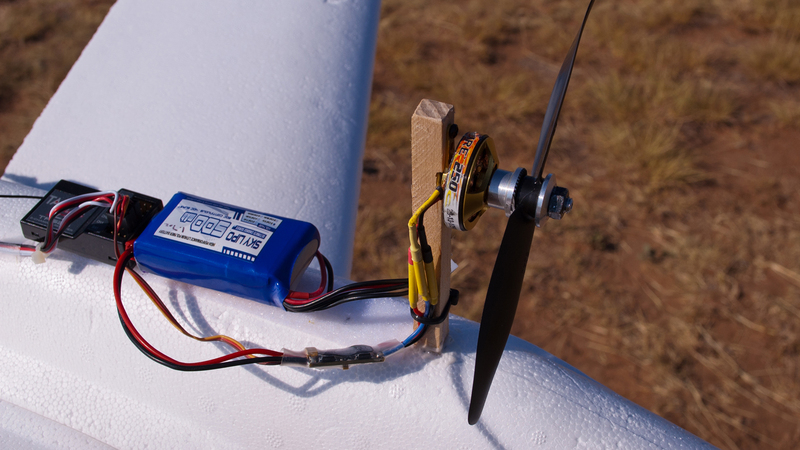 The motor includes a "wobble mount" for attaching props with an O-ring. I prefer a more solid attachment, so I used a Great Planes collet adapter. The 5mm prop shaft of the adapter matches the hub of GemFan props perfectly, so no shims are necessary. The Titan balances correctly with the power system components mounted in the same location that the receiver battery formerly occupied. I anticipated that I would have to move around some of my onboard components to maintain the same center of gravity as before, but that was not the case. With the LiPo battery mounted against the receiver using the existing Velcro strip, the Titan balanced perfectly at the desired CG point. Bonus! The powered Titan will be flying faster and higher than it did as a glider, so it's time to start thinking about tailoring its control response. If your radio offers dual rate controls, you may want to configure them. "Dual Rates" lets you choose how much total travel each servo has with the flip of a switch. Less travel makes the model less responsive to your control inputs. This is typically a good thing since new pilots tend to over-control their models. The TTX850 actually has triple rates. I set mine up with 100%, 75%, and 50% rates on pitch and roll. I'd suggest that beginners start flying the Titan with 75% throw and bump it down if you have a consistent problem with over-controlling. 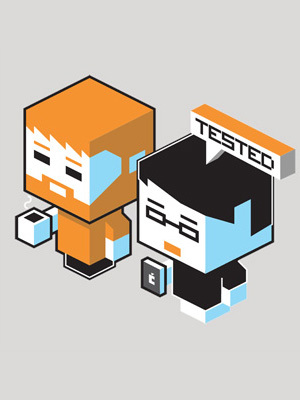 Likewise you can enjoy the responsiveness of 100% throw as you gain confidence. Before taking the powered Titan out for a spin, I decided to add a little color. I know that I mentioned more than once in the build article that you should not worry at all about the looks of this plane. I still stand behind that. The color I added has a purpose. The wide stripe that wraps around the left wing will help your orient the Titan as it is flying. OK, I'll admit it. The light blue paint I added to the canopy was just for looks. I broke my own rule. I used water-based latex house paint that I applied with small foam brushes. Add paint sparingly because the weight can add up if you go crazy with it. Most spray paints will dissolve the Titan's styrofoam structure. I was able to use blue spray paint to accent the wing stripe by very carefully and lightly adding paint only on top of the dried latex coat. The Rimfire 250 brushless motor is tiny, but it provides plenty of power for the slow-flying Titan. Having a motor gives the Titan considerably more flexibility than it had as a glider. Even so, I recommend that you continue to approach flying this model in preplanned, graduated steps. Start small and grow big. There are way too many variables involved for me to give you a thorough flying tutorial here. I'll try to cover the big stuff. Some things are best learned by trial and error anyway. As with gliding, make sure that you are in an open area where you won't be encumbered by trees, buildings, or spectators. Just learning how to keep your model in the air can be a challenge. You don't want to have to dodge things too. Also wait for calm weather with single digit wind speeds. It is easiest to launch the Titan with ½ to ¾ power. This prevents it from nosing over due to the high mounted motor. The high thrust line of the Titan's pylon mounted motor will tend to make the airplane pitch down when you add power. The upward angle that we introduced to the motor mount will pretty much mitigate this effect during cruise flight, but it will still be evident when you have a combination of high power and low airspeed….such as when you launch. I suggest that you launch the model with 1/2 to 3/4 throttle and be ready to pull back on the control stick to get the nose up if it becomes necessary. Once the Titan has picked up some speed, you can ease in more power. For your initial flights with the powered Titan, I recommend treating it as a powered glider. More specifically, you should use the motor to climb to altitude. Then shut the motor down and descend in a glide. This will help you ease into the additional burden of managing the throttle on top of the directional controls. At full power, the Titan should comfortably climb at about a 30-degree angle. If you try to climb too steeply, the airplane will lose speed and eventually stall. If you notice the airplane slowing down, just ease off of your back pressure on the right control stick. This will lower the nose and the model will accelerate. It is sometimes hard to judge from the ground how fast a model is flying. Your first indication that it has slowed may be when it tilts over in stall. Don't panic if this happens. Allow the model to descend so that it can get back to flying speed. Sometimes the best thing you can do in such a situation is nothing at all. Always remember that the Titan started out as a free flight model. It can fly just fine all on its own. In any crisis, all you have to do is pull back the throttle and let go of the right stick. As long as you have sufficient altitude, the airplane will self-recover to level flight. Yay physics! You will quickly notice that the Titan no longer glides as well even though it is no heavier than before. This is because the prop will windmill in the breeze as the model glides. This creates a significant amount of drag that negatively affects efficiency. You can add in a few clicks of throttle to help regain that loss. A common problem that I see with new pilots is that they take off without a flight plan. Don't get me wrong, aimless wandering is a lot of fun once you're a competent pilot. But it invites trouble for those who are still honing their reflexes. Your flight plan doesn't have to be complex, but it is important to give yourself a goal. Starting out, you may just set out to fly one clockwise circuit to climb. Then descend in the same direction. Maybe, the next time up you do the same thing in the opposite direction. The point is to always have a goal for where you want the airplane to be and proactively work to put it there. You don't want to fly reactively. Be sure that you keep the model plenty close enough for you to see it clearly. The wing stripe will help you stay oriented, but the profile of an airplane can be confusing as it gets further away. Keep it close and you won't have any issues. The single stripe on the left wing is useful for maintaining visual orientation of the Titan…especially in overcast conditions, as shown here. After a few climb-and-glide sessions you'll probably be ready to try continuous motor runs. Climb to 50-75 feet of altitude and then throttle back. My Titan cruises nice and slowly at just above half throttle. You'll then want to practice making turns in both directions without gaining or losing altitude. I've been able to get 15-20 minutes of flight time per battery when flying this way. With that much time at the sticks, your logbook and skills will expand quickly. There will likely be times when you get out of sorts and a crash becomes inevitable. Train yourself to shut down the motor in these situations. 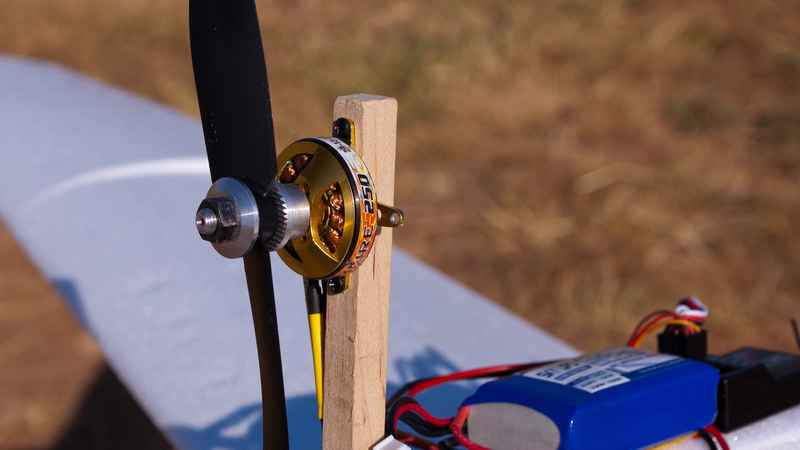 Having the motor off before impact will minimize damage when the model hits the ground. It is equally important to make sure the motor is not running (or trying to) after the Titan is on the turf. If the propeller becomes broken or entangled in grass during a crash, not shutting down the motor could cause significant additional damage. If you find yourself getting really confident, the Titan is even capable of mild aerobatics with 100% control rates. It will carve through impressively sharp turns and even pull off a respectable loop. This model is at its best, however, at medium power settings with a soft touch on the controls. The Titan is a gentle flyer that is good for training unsteady rookie pilots. It's also fun for relaxing afternoon flights. 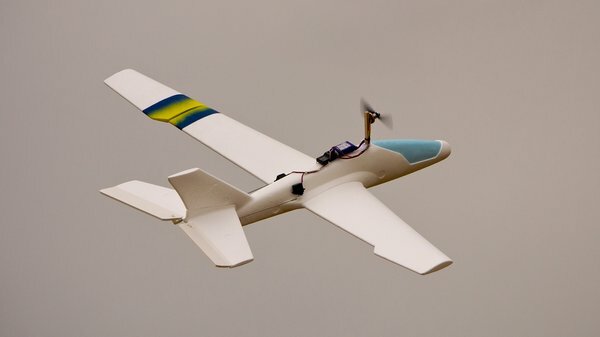 Having an experienced tutor will give you your best chance for success in learning to fly RC. 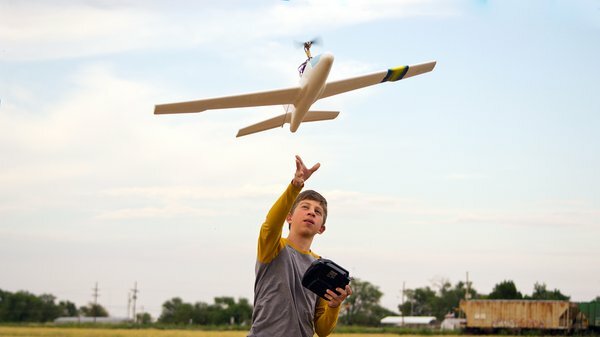 I've said it multiple times before, but I think it's worth repeating: Having an experienced tutor will give you your best chance for success in learning to fly RC. It isn't a prerequisite, but an instructor will give you a significant boost. For those of you who decide to venture out alone, I think this Titan conversion provides a practical and affordable avenue to learn the basics. Once you've become comfortable flying this model, you'll be ready to take on more powerful and aerobatic airplanes (or gliders). You may want to keep the Titan around even after you've earned your wings. Sedate models aren't just for training, they can be a lot of fun for a relaxing afternoon flight. It is also likely that your dive into RC will spark the interest of neighbors and friends. Then it's your turn to be the teacher! Note: Since this model falls within the weight criteria set by the FAA, you must register yourself as a UAS pilot on the FAA website and pay a $5 fee. With any luck, the pending legal challenges to this overreaching policy will soon gain traction. Until then, you have to register.